• A model of lease of port areas: a new contribution, by Carlos Henrique Rocha, Ivan Ricardo Gartner, Luiz Ricardo Cavalcante [paper in English]. • Collective public transportation systems and spatial interactions in Marília and Presidente Prudente, by Rodrigo Giraldi Cocco, Márcio Rogério Silveira [paper in Portuguese]. • Possible improvements in intercity transport system: the case of the waterway connecting Manaus and Careiro da Várzea, by Rita Carolina Dias Santana Duarte, Nelson Kuwahara, Marcelo Duarte da Silva [paper in Portuguese]. • Demand for air travel in the Brazilian economy: a co-integration analysis, by Patrick Franco Alves, Gustavo Varela Alvarenga, Carlos Henrique Rocha [paper in Portuguese]. • An empirical study of airline predatory practices, by Natália dos Santos Ferreira [paper in Portuguese]. • Airlines performance: a world analysis, by Elton Fernandes, Heloisa Márcia Pires [paper in Portuguese]. • Study of operational performance of Brazilian airports related to cargo movement, by Daniele Silva Oliveira, Anderson Ribeiro Correia [paper in Portuguese]. • Impacts of using distribution centers in outbound logistics of finished goods, by Bárbara Coutinho Fernandes, Fernanda Heloise Galamba, Lucas Irineu Tosta, Renato da Silva Lima, [paper in Portuguese]. • Evolution in the train mode travel times at the Metropolitan Region of São Paulo, by Carlos Eduardo Paiva Cardoso [paper in Portuguese]. 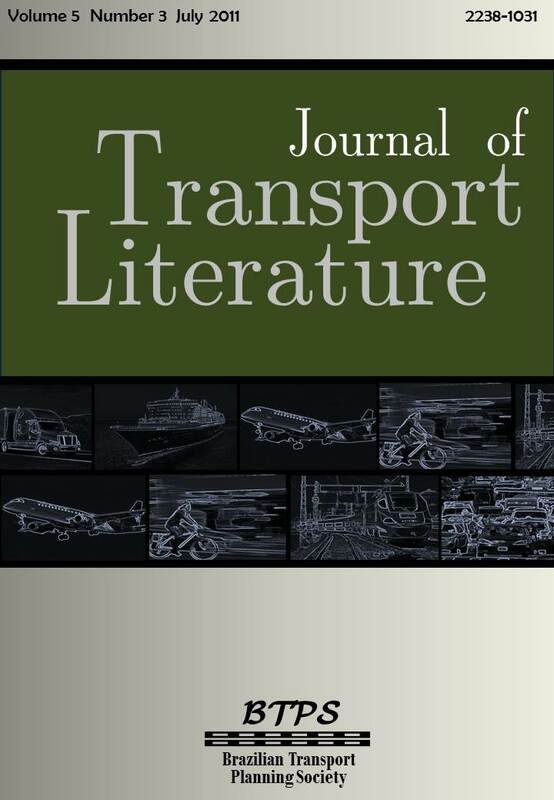 • Application of multicriteria method on the planning of mass rapid transit systems , by Marina Ciarlini, Anderson Ribeiro Correia [paper in Portuguese]. • Leasing of aircrafts in Brazilian regular air transportation market, by Fábio Anderson Batista dos Santos [paper in Portuguese]. • Analysis of the recent literature on air transportation emissions taxation, by Paulo Rogério Perez Silva [paper in Portuguese]. • Climate change and civil aviation in Brazil, by Jorge A. Silveira, Rafael Matera, Daniel Nicolato, Luiz Brettas, Fabio Magalhães [paper in Portuguese]. • Brazil's Domestic Air Cargo Market: A Descriptive and Econometric Analysis, by Rafael Fraga [paper in Portuguese].